This is one freebie earning program that REALLY works EASY. Read about how I'm earning freebies with no effort at all. Harmful UV rays can penetrate clothing. Protect baby with Agoo Activewear, which features UPF 50, stain resistance and is anti-bacterial. Get FREE shipping on ANY order this weekend with code MDW2009 at Avon.ca - STARTS TODAY! So if you just want to purchase those 3 for $10 Glimmersticks Liners - (buy at least 2, get a FREE mini-tweezer too! ), buy them now and get the free shipping! Don't forget Mother's Day is May 10! Click here to view my roundup of Mother's Day specials from Avon. The offer ends at midnight on May 4, so shop now! You can't go wrong on Mother's Day with flowers! And you can get $5 off your order at OConnorFlorist.ca using code MDAYS. No minimum order required either! Don't forget to log in to www.airmilesshops.ca first, so that you can get 1 Airmile for every $20 spent at OConnorFlorist.ca! Ellaroo Mei Hip and Ellaroo Mei Tai carriers are on sale for $67.96 and $71.96. A very nice baby carrier. Isabooties are on sale for $24.95. There is a good selection of styles to choose from. SOZO Nap Saks for $36.76. These are super cute! There are other items on sale too, click here to check it out! Shipping rates are reasonable, starting at $7.95 for up to a $50 purchase. Tonight from 5pm to 10pm, head down to Baskin-Robbins for a 31 cents scoop of yummy ice cream! That's $0.31, plus tax. As a thank you to customers and the firefighters who protect them, Baskin-Robbins is donating $10,000 to Canadian Fallen Firefighters Foundation. All collected consumer donations will be used by CFFF to build the Canadian Firefighters Memorial in Ottawa. Your 31 cent scoop will be a 3 oz. soft serve cone or 2.5 oz. hard scoop. Limit three scoops per person. Click here to find a Baskin-Robbins near you! Mother's Day is coming up fast - it's on May 10! Here's a roundup of deals that any Mom would love from Avon.ca. FREE shipping from April 30-May 4 on ANY purchase with code MDW2009. FREE shipping with $35 purchase - use code AVON35. FREE Luxurious Silver Clutch Gift Set or Bath & Body Gift Basket Set with $55 purchase. FREE mini-tweezer with select product purchases. 6-Piece Beauty Collection - For $29.95 (reg. $79,9get a pink beauty bag, Kabuki face brush, Perfect Wear Extralasting Lipstick, Ideal Shade Smooth Mineral Makeup, Anew Force Extra Eye Cream, and Daring Curves Mascara. Glimmersticks Liners - 3 for $10, or $2.95 each. PLUS buy at least 2, get a FREE mini-tweezer. You can get a free mini-tweezer with other select products as well. Skin So Soft Original Bath Oil - 2 for $13. Sparkling Flower Link Tennis Bracelet - Get this lovely bracelet at 50% off for $9.99. There's lots of other items on sale, these are just the Mother's Day ones. Some of these deals end May 6th, so shop now! You can get a FREE meal on your birthday at Pajo's - famous for their fish and chips! The free birthday meal is any small fish and chip meal with a drink, or a burger and fries with a drink. All you have to do is fill out this form, and they will email you a coupon for the free meal. On your birthday you need to bring the coupon and your photo ID. Pajo's has locations at Steveston, Port Moody, and Port Coquitlam. Thanks to Sharylin for passing on this freebie! The Stonz Wear booties website has a sale on four styles - I know, only four styles, but they are so cute and where else can you buy them online? These booties have an adjustable toggle at calf and ankle for custom fit and fleece-lined inside for warmth. Made in Canada! On sale now for $29.95 (reg. $46.95). If your baby/toddler already owns a pair of Stonz, enter a photo of your babe wearing the Stonz booties for a chance to win a new pair of booties! This is a quarterly ongoing contest they run. You can get a rebate of up to $75 from KitchenAid when you purchase select KitchenAid appliances between April 9th and May 10th, 2009 from an authorized Canadian KitchenAid® Appliance Dealer! Click here to view the qualifying appliances and the rebate amount for each. You'll need a copy of your KitchenAid purchase receipt and the UPC code to receive your rebate by mail - you can submit your claim at www.KitchenAid90.ca or use the form on page 3 of the PDF. You can also receive instant rebates if you buy from shop.kitchenaid.ca! Go to www.KitchenAid90.ca to enter the KitchenAid 90th Anniversary Contest to win a 4 piece kitchen suite from KitchenAid Home Appliances valued at $8,000! You can also enter the Viewer's Choice Pictures, Videos, Stories, Recipes contest. Submit a photo of your KitchenAid appliance "dressed in a unique way" (!?! ), or a video, story, or recipe for a chance to win a $500 shopping spree at the KitchenAid Small Appliance online shopping site shop.kitchenaid.ca! Contest closes December 31st 2009. See the website for full rules and regulations. Golly Geez Baby is having a site-wide 25% off sale! Use coupon code GGB-0925. 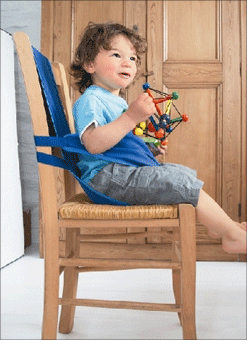 They carry organic clothing, non-toxic teethers, and other fun yet functional baby products, like this Grobag Chair Harness for $19.99 (with discount). 2010 Update: Click here for codes valid in 2010! Have you signed up with the new Huggies Enjoy the Ride program yet? By signing up, you are entered to win a year's supply of diapers. And even if you don't use Huggies, you can still sign up and accumulate points, because you can earn points by watching videos (commercials), answering polls, or doing "browse activities" such as contributing your own "tip" to a website. (It doesn't seem like they have codes on products, the way it is with Pampers). Signed up - 10 free points. Watched 3 videos (OK I admit it, I didn't watch at least one of them, just played it out!) for 2 points each - total 6 points. Answered the poll - 1 point. Entered freebie code BBWBH-SDHFQ-CJPGB - 1 point. Entered freebie code WPBXZ-RDDNS-PPPGB - 2 points. There are three "browsing activities" for 1 point each as well, which I have not done. And, you can help them spread the word about the new program by email (they have a special email for you to forward to others) so you could have a total of 23 or more points without purchasing Huggies. You can use your points to enter sweepstakes for a Mom makeover, a Zigo Leader carrier bicycle, or a $50 GAP gift card. Or you can use them to enter "instant win" contests for a music download, $10 Subway gift card, $25 GAP, Bon Appetit, or cash gift card. Good luck, let me know if you win something! Vancouver-based Lavish & Lime carries products that fit into at least one of the following categories: eco-friendly, natural/non-toxic or made in Canada. Their extensive line of products include items for babies and kids, jewelry, accessories and clothing for mom, and home products, too. They currently have a 15% off promotion in their "Sale Shop", just use code LAVISH15. For everything else, get 10% off with code CUDDLES (expires April 30)! Source: TrueCuddles.ca - check out their "weekly cuddle" of a baby or mommy product at a huge discount! In Vancouver, the Canada Line construction on Cambie Street is finally complete! To celebrate, there will be a free concert by 54-40, and lots of other activities, such as food samplings and of course there will be giveaways! The main events will happen outside of Best Buy at 6th and Cambie. Click here to check out the day's activities! I don't think this sale is much of a secret anymore! Bring in this coupon to Banana Republic for 30% off your entire purchase! Sale starts today, through April 26! This is so cute and perfect for the shoe-aholic! It's a tape dispenser in the shape of a lovely red-heeled shoe! 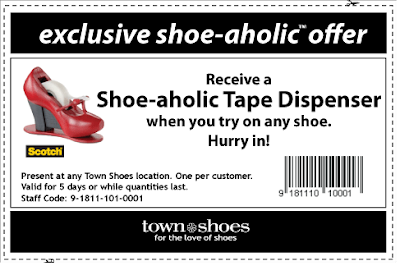 And it's FREE from Town Shoes while quantities last - just present this coupon! A huge sample sale in Toronto / Markham area! Choose from Paul Frank, Timberland, Victorinox, New Balance merchandise! You can also get 10% off a $100 purchase with this coupon! Sale is on from today until Sunday April 26, at the Markham Fairgrounds 10801 McCowan Rd. Click here for more details! Thanks Sharylin for the info! One more Earth Day special for you - this special is on until April 30. Get 20% off everything at online store Body in Balance Acupuncture - their products include SIGG and Otterbottle water bottles. Just use code earthday at checkout! Go to Uddercovers.com and click on Shop Now it will prompt for a promo code. Type in "onefree", you can get a free nursing cover! There is only pink and blue available, and it may be on backorder and won't be shipped till May. You will still have to pay for shipping - $9.95 for Canada. They retail for $32, so it's still a deal! Another Earth Day special! Get 20% off select eco-products at GoneShopping.ca! Choose from soy candles, organic blankets, Kleen Kanteen, Built NY bags, and more! Have you heard of Wallies products? They are creative murals, cutouts, chalkboards, cutouts, and dry-erase products that you can peel and stick to the walls, cupboards, floors, wherever you like for instant design savvy! Today until tomorrow, you can get a great 35% discount at online store StyleKid using code WALL35 to save 35% on all in-stock Wallies through April 23rd! There's lots of Wallies items at the store that are already discounted, too - looks like the additional 35% discount can be applied on top! Hurry though, April 23 is the last day of the sale! Huggies has launched a new points rewards program! Called "Enjoy the Ride Rewards", you can earn points from entering codes, answering polls, watching online videos, or browsing websites. Rewards that you can redeem for include a chance to win in sweeptakes and giveaways. Once you sign up, you can type in this code to get 15 points total in your account: TKHNF-RLPLS-TRPGB. After that, there will be a printable coupon for $2 off any package of Huggies diapers! Bugalug Baby, creators of baby accessories from Alberta, has a 25% off sale from now until May 1 ! Their products are "Simple accessories that stay in place". Choose from barrettes, pony loops, headbands and soother clips for girls. There are boy-style soother clips to choose from, too! Check out their sale at www.Bugalugbaby.com. Roots is having a customer appreciation sale! 25% off everything including already reduced merchandise! This sale starts Thursday April 23-27 noon, EDT. To get the discount you need to click here and print this and redeem in-store, or shop online at Roots.ca and use coupon code SPRING25. Bebebums is celebrating Earth Day with a 15% off sale starting today, until Sunday April 26. Use discount code earth2009 at checkout! Are you planning to travel with one or more little ones this summer to Vancouver, Victoria, or Toronto, and considering renting baby equipment? If you book at Weetravel.ca by April 30 for rentals between June 1 - August 31, your name will automatically be entered to win a prize pack valued at over $250. The hot parenting book Raise Your Kids Without Raising Your Voice by Sarah Chana Radcliffe. You can rent from a full range of the latest baby gear, including infant and child car seats, folding cribs, pack 'n plays, strollers, highchairs, swings, bouncers, safety products and more. Another Earth Day special: get 10% off on Earth Day, April 22, at LittleFootprintsToys.com, where you can shop for eco-friendly toys for kids of all ages! Don't forget to bring your travel mug with you tomorrow, April 22, so that you can get your free Starbucks coffee! Starbucks is offering a free coffee on Earth Day, Wednesday, April 22. Just bring your own travel mug to any Starbucks and they'll fill it up with Pike Place Roast coffee! Click here to see the Starbucks website for more information. Starbucks also takes 10 cents off your drink any time you bring in your own travel mug! Starting today until Wednesday April 22, there's a huge sample sale happening in Vancouver with more than 20 clothing manufacturers participating! The sale has clothing for babies, children, men and women. Labels include Point Zero, Sweet Peanut, Petunia Picklebottom, Dots and Dreams, Babylegs, and more! The sale is at the GX building at 1868 Glen Drive, across from the Home Depot building on Terminal Ave. CASH ONLY. Some will take cheques. Open 9am-5pm. See all the details, and other sample sale info here. If you have a child, chances are you've used a saline spray to help out with the stuffies due to colds and allergies. Hydrasense is a nasal product that helps relieve dryness, congestion, and mucus accumulation, and it is made of purified sea water. Here's a $5 coupon for any Hydrasense product, and it doesn't expire until December 31, 2009. Hydrasense has products for babies and adults. The baby products are Easy Dose and Ultra Gentle Mist, and Easy Infant Dose. See their website here for more information on their products. It's as if I wished for them and now it's here - just a couple days ago I was hoping for a Baby Mum Mum biscuit deal. My baby loves the rice husks and I prefer to give him these over the messier Farley's and Arrowroots. The Mum Mums are also individually wrapped, so it's great for on-the-go! Well, voila, there is a buy 2 save $1.00 coupon for Baby Mum Mum biscuits on Save.ca! (wow, reminds me of The Secret) OK so not a huge savings but every penny counts! Other baby/kid-related coupons you can get are for Pampers products (up to 3 items), Gerber 1st and 2nd Foods, Gerber Graduates, Aerius Kids Allergy Remedy. McDonalds Canada is offering their premium roast coffee for FREE during breakfast hours beginning today until May 3. There is a commercial spot on TV running about this promotion. The only details found online for this promotion is on the McDonald's Canada Facebook group site - click here to see the for yourself. Limit one per customer, per visit. Not available with an extra value meal or Value Picks. Opening hours vary by restaurant. Until 11am on weekends. Let me know when you get your free coffee if you had to purchase anything! All you mommies (or all ladies) out there, spring is here and why not pamper yourself (and your partner!) with some new lingerie! Since there ARE deals to be had! Bring this VIP coupon with you to La Vie En Rose from April 23-26 to get 35% off items that are already discounted 20%! Go online to LaSenza.com and use discount code COVER5 for $5 off $25, or COVER10 for $10 off $50 purchase! To get these deals in-store purchase, use this coupon! If you still don't have a good stash of eco-friendly bags yet, you can get up to 2 bags free at a Staples store. All you need to do is bring in an empty HP Ink or toner cartridge to Staples. Limit 2 per customer. This was advertised in Vancouver. Check with your local Staples to see if the same promotion is available. Toys R Us is celebrating the Little People 50th Anniversary with in-store birthday parties at select locations in Canada! You are invited to decorate your own birthday party hat and receive a Little People gift bag! See the complete information on the Toys R Us website. No party near you? You can celebrate by entering the Little People Anniversary contest - see my post about the contest here! TJ's Kids store has several sale promotions on right now! Free Radian travel bag (value $29.99) with any Radian car seat ONLINE purchase. The Premier Monaco model is on sale for $199.99. TJ's ships across Canada and to the US. They have a flat $18 shipping rate to certain locations in BC. With Mother's Day coming up, you might be considering a gift for Mom from L'Occitane. You can buy online and get $20 off a $80 purchase! Use code SPRING90! You'll also get FREE gift wrapping (with $60 purchase) and 3 FREE samples of your choice! Shop online at www.loccitane.ca. Which means that you should be able to score some super deals! There's still $2.99 items, too. Check out the sale at PleaseMum.com! SportMart has issued coupons totaling $85! Click here to get your coupons! They are valid until May 3, 2009! Looks like they are for in-store use only. Get 25% off all clothing and shoes at GingerbreadMonkeys.com! Lots of brand names such as VANS, Puma, Diesel, and Juicy Couture. Use discount code Spring25 at checkout! Sale ends April 19, midnight PST. Some restrictions apply, see their website for details. Gearing up for summer... here's one for the older kids. It's from the Canadian Off-Highway Vehicle Distributors Council (COHV). You can get a FREE COHV Off-Highway Vehicle Safety Interactive Adventure Trails CD for your child's computer and a FREE Activity Book. You can download a PDF copy of the activity book as well. Click here to order your free stuff! You can browse more than 70 styles of shoes by Canadian company Jack and Lily at JackandLily.com. The shoes are made of 'Lamb Touch' leather and skid resistant suede soles. Their current promotion is buy 2 pairs, get FREE shipping! Use code FREESHIP. Have you been eyeing something special at the GAP, and it still hasn't gone on sale? You can get a discount on it with this 20% off coupon! Applies to regular-priced, in-store items only, and valid from April 16-19, 2009. See the fine print for other restrictions. Please Mum is having an exclusive online sale this Easter, and it starts today! Get 20% off all purchases, including already sale items! Use discount code EASTERWK20! The sale runs from April 9-13. Prices on some items are low, low, low! $2.99 deals on long or short sleeve tops, pants and leg warmers, cute character beanie hats from $2.00, great deals on snow overalls at $10.39, buy for next season! And there's still the 20% discount on top of that! "Children can play outside feeling warm, unrestricted and dry in their PVC and Phthalate free rain wear - certified by öko-tex to be free of over 100 harmful chemicals." Click here to read more about the technologies. Puddlegear is having an Easter sale, 15% off this Easter Friday to Monday! See their website, www.Puddlegear.com, to view styles. Orders are placed by phone. TODAY ONLY, get 50% off at Bug & Pickle, creators of lotions and potions for Mom and Baby that use wholesome ingredients. You will find belly creams, belly rub oils, baby (body) butter, and unique items such as scalp oil (for cradle cap) and teething oil. They also carry hooter hiders and blankets. Use discount code 'twitter'! Click here to start shopping at Bug and Pickle! Have you heard about Agoo Clothes for Active Kids? Their clothing has UV protection (UPF +50, wow! ), stain resistant, and wicks away moisture. And now you can get 10% off using discount code bob10! Agoo also makes these cool bamboo leg huggers that I blogged about last week, and you can also get two pairs for $17.98 using the discount code springLH. Click here to start shopping at Agoo! Hazel & Company maternity and women's clothing store in Vancouver is having a customer appreciation spring sale, 20-80% off! They are also in a new location at 4280 Main St., at 26th. The same sale is on at their sister sale JOOLS, at 4255 Dunbar at 26th. Source: Thanks to my Twittering pal Lexi. Check out her awesome blog! In my "Twitterverse", these are people who follow me... doesn't the mosaic look cool! Click on any of the images to see their tweets and follow them! Happy Twittering!